The day began at dawn with lots of high pitched bird song so I got up watched a nutria swim away from my lake front property. According to the sign on the nature trail the nutria is an aquatic rodent imported from South America to control water weeds that is now a pest. I am reminded of the title of John McPhee’s excellent book: The Control Of Nature. 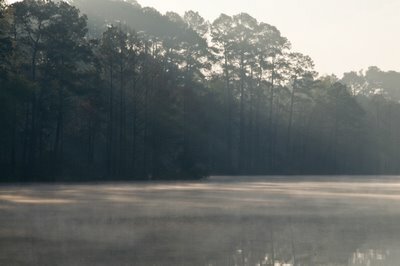 After a shower I spent a couple hours taking photos of the mist coming off the lake at sunrise. A look at the map shows there are few camping options in Louisiana so I picked Chicot State Park and told the GPS about it. This should be interesting. If you think I am prejudiced against Texas, Louisiana is way outside my cultural comfort zone. But actually as I crossed the river at Logansport it seemed kind of dowdy and elegant. The park was booked up for the weekend. What was I thinking? This is Louisiana! They celebrate anything and probably especially Easter. Yes there are parties being held. Back on the road again for hours finding no good deals or guidance for a place to sleep. Finally landed in a Motel 6 near Baton Rouge. Tired. Dawdled around the hostel doing Internet and laundry and breakfast. I felt lazy so I asked for another night but they were booked up. So I did my errands and got a little tour of Austin. It could be anywhere in the US. Little Texas stigma visible. Tee shirts and bumper stickers demand: “Keep Austin Weird.” The Whole Foods store was as big as Walmart. Huge and jammed with stylish graceful people. We are out of the desert now. Lots of water here. So I head east again. 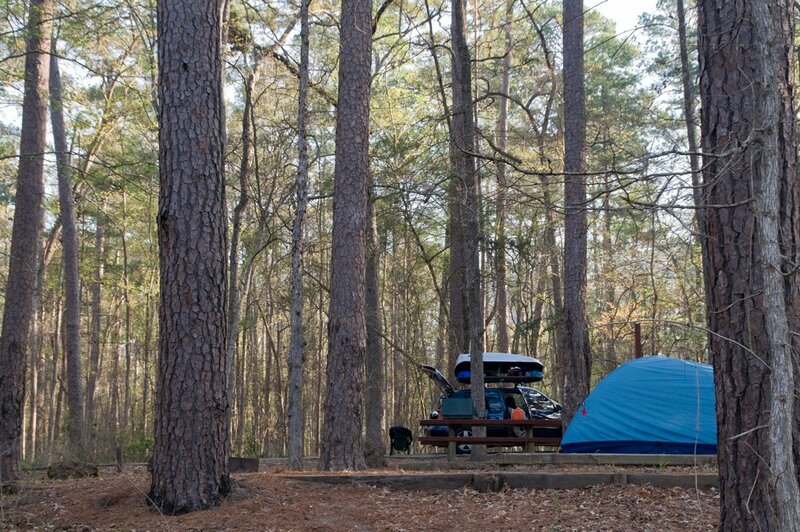 The first spot of green on the map—Davy Crockett National Forest as target. But the GPS has no knowledge of the new freeways and toll roads and sends me too far north and then by two lane blacktop across rolling green pasturelands and running rivers. Historical markers every couple of miles and almost that many churches. There is a wide shoulder and the convention is to pull onto it when someone starts riding your bumper though we are all rolling at the posted 70 or better. I pull into a “recreation area” in the National Forest and, sure enough, there is my campground in a loblolly pine forest with blooming dogwood trees and little Ratcliff Lake. My new tent replacing the cheesy one I bought about a week ago seems small but better. REI has a nice replacement policy so it is worth trying. Rice and beans as night falls and the frogs start peeping. Starlight, full moon rising, fireflies, and—oh baby! This computer is attracting a lot of mosquitoes. I’m out of here and into the tent. Drove into the late morning sun and filled up the car and my stomach just before noon at a Texas truck stop. Phone calls discovered that the mechanic I want to work on my car is leaving Austin in the morning so I can just make it this afternoon and wouldn’t have been able to if I had not passed on the nice little RV site in Marathon and been shut out in Ft. Stockton. Funny how that worked. I drove straight through over 4 hours with only one pit stop and found Anuthee in a little shop outside of Austin. He did twice as much as he charged me for. I hope he has a great time in Colorado with his girlfriend. I like my shiny new aluminum skid plate under the engine of my little car. By the time I left the shop I was exhausted and starved so I checked in at the local Hostel International and got directions for a Vietnamese restaurant. The hostel lives in a beautiful location with the city lights reflecting from across the lake. The scene—inside and out—could as easily be in Seattle. I’m tempted to hang out here for another day since I have no idea where to go next. Too tired to think about it and, judging by last night, it never seems to be too late to decide. I was thinking of Padre Island but I learned it is the place of choice for the spring break crowd. Pass. Frost on the picnic table but clear and promising and no wind at all this morning. While waiting for the gear to dry I looked for the definitive closeup photo of a Vermilion Flycatcher. I didn't get the shot. Packed up the camp and got to the foot of the Lost Mine trail at noon. Beautiful day and the best scenery of a lot of fabulous scenery in this park. Beautifuller and beautifuller as I climbed. I had a great day climbing what turned out to be about 2000 feet, taking photos, and chatting with my fellow hikers. The views were magnificent all the way up and on top and then coming down again. I drove on out of the park thinking about all the beauty I've witnessed here. Someone in Alpine last Saturday asked me what I thought of this area and I said: "It's like living in a postcard." It is overwhelmingly picturesque. And Judy was right: you need to give this place more than a day or two to let it get to you. It seems to present the struggle and drama of life in a naked way. You can see the bones of the earth and how life utilizes earth's infrastructure and strategizes survival. 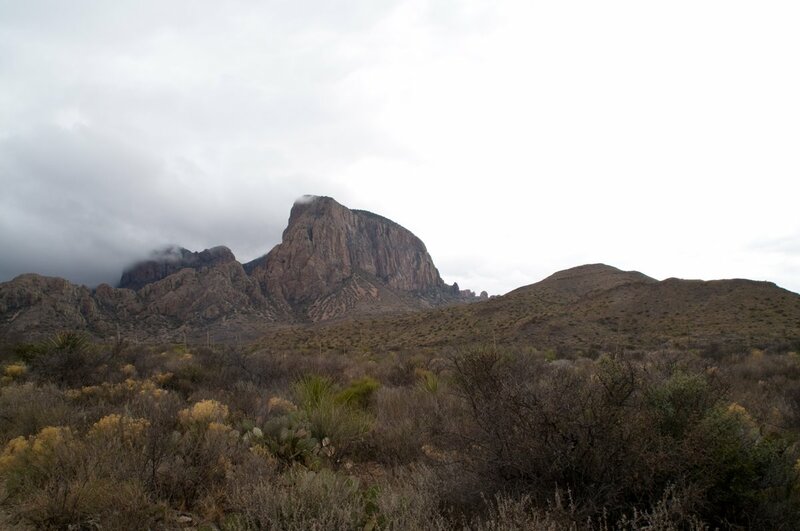 I am humbled by and grateful for the preservation of such a large chunk of nature in Big Bend park. I passed on a lovely RV site in Marathon TX for no good reason and went to Ft. Stockton where there were no vacancies anywhere. So I drove the interstate another hundred miles to Ozona—wherever that is—and computed until midnight. I'm looking into my own judgement issues and trying to see what I can change about myself since I don't seem to be able to change everyone else. I'm guided to ask whether those judgments come because I still want people to care for me so I don't have to. In other words, another maturation issue. I awoke early and payed $7 for another day. Cold. Windy. I went for a nature walk with ranger Claudia who told us many things that were edible and medicinal in the desert. I was planning another hike but it was way too cold. I drove up into “The Basin” where it was actually snowing. Hard to believe I was overheated and dehydrated only yesterday. Perhaps I will hike tomorrow which is predicted to be pleasant. 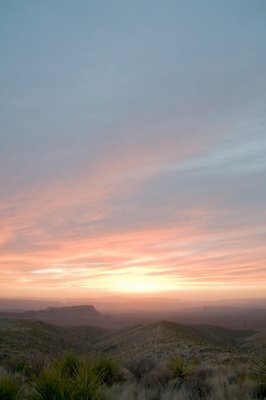 I went back into Terlingua and charged up my batteries and chatted with Judy and Steve, said goodbye, and did laundry. Another night or two and it will be time to hit the road. Back to the campground stopping and taking photos along the way. The wind is blowing hard and cold having swung around from the north. I was up for a long time during the night. Then I dreamed of whales. After a gentle morning I set out hiking for Mule Ear Spring in the noonday sun. Strange and yet rich desert in drought time. They are way late for the spring rains that would usually have this place blooming by now. 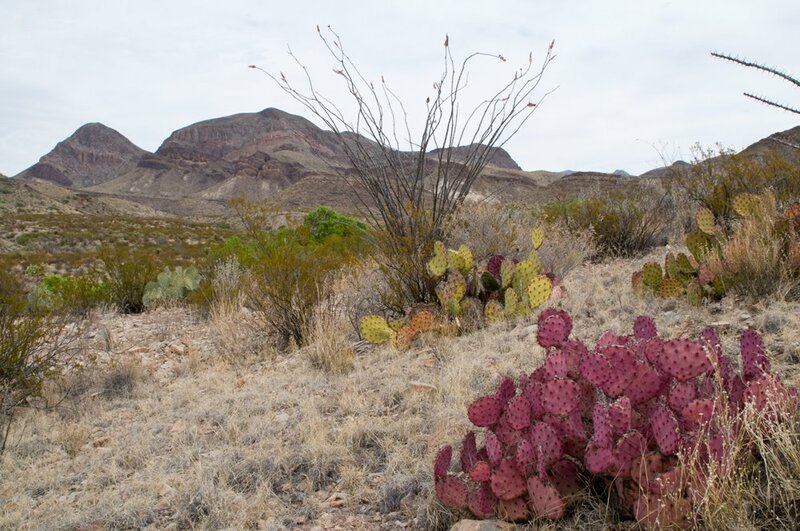 The prickly pear (they have several varieties) look stressed and some are dying. And then right in the middle of it is a sweet little spring running down a hillside into a short crystal clear stream with frogs and polliwogs. Plants are flowering here and the bees are all over them. I took some photos and walked back to the car rather slowly wishing I had brought more water or at least my purifier so I could have tanked up at the spring. I have probably doubled my usual 2 liters per day intake lately. Hot. Windy. 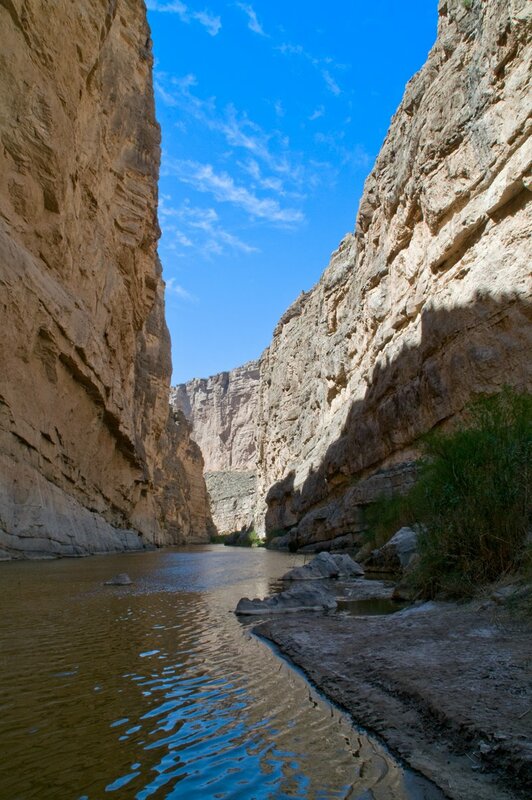 I took myself down to the river and immersed in the cold Rio Grande which was ever so refreshing. Back at the campground I did some photo processing and tried to figure out how long to stay. Maybe I will head out tomorrow. Maybe not. 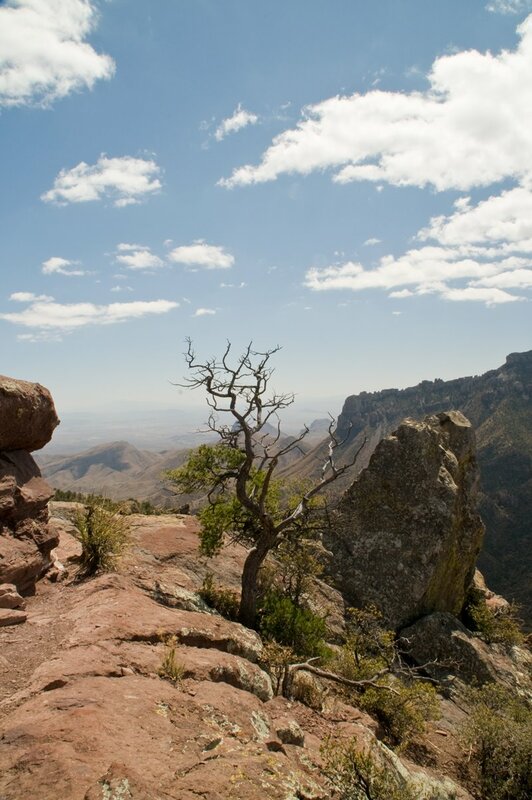 I got a grand tour of the Big Bend National Park by my old friend Judy B. She used to work in the park and has hiked it with her fellow naturalist husband Steve. It is so huge we didn't get to see much but she kept pointing out places I had to go to see beautiful stuff. 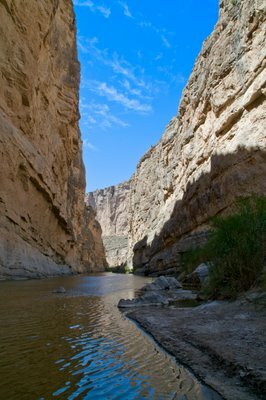 We took a little hike into Santa Elena Canyon. That is the Rio Grande and the wall on the left is Mexico. She helped me find a nice campsite and I will return tonight and stay for a couple days to explore. Her sympathetic ear helped me gel some of the ideas I have been hatching and she knows so much about the flora and fauna that it is scary. I can show her my photos and she identifies the birds, plants, places, et al. Good day, good thoughts and conversation. This was left out of the previous blog entries. Splicing it in here. My friends were busy with their house building project so I took a look around the area. I drove to Lajitas which is an old crossing of the Rio Grande. There is still a four wheel drive road across that looks as if it gets some traffic. The deal is you are free to cross but you can’t come back the same way. You have to re-enter at a port of entry which is a day’s drive away. Bizzaro. There is no obvious border patrol presence that I see but there are only a couple ways out of here northward and there have full stop checkpoints. Also they had a roundup recently that wiped out about 20% of the local school population. When one member of a family is found and deported often the rest of the family who are legal will go to mexico to stay together. I drove up into the huge Big Bend National Park and checked out the busy visitor center. This is spring break, their busiest week of the year. People were waiting in line for the bank of computers used to register a campsite. I drove back to Terlingua getting quite sleepy because of the 45 MPH speed limit on the empty road. As soon as I left the park I woke up in the 70 MPH zone. I drove the 70 miles to Alpine in the evening to attend the only listed NA meeting within . . . well, who knows how far. It was a great meeting and I really was stimulated to work on the topic: growing up. Really, it’s quite wonderful how just putting oneself in a context of self improvement moves one toward solutions. I feel transitional again and that is good. I watched carefully for wildlife on the road back but saw only one deer and her fawn. At the legal speed they didn’t even know I was coming until I was past them. Hey, Texas still has three lane highways. I didn’t know any state was still so casual about the survival of its residents. A log of travels with camera and a mind that, hard though I try, won't stop thinking. 3-27-08: Where Next? Uh, dunno.